Blogger Peter Tan might be very interested in this. 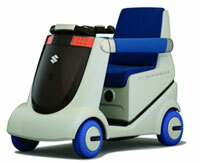 While the rest of the automotive industry is focusing on applying fuel cell technology on cars, Suzuki is applying the technology in the powered wheelchair market – and its latest prototype, the MIO, features a fuel cell that uses methanol as a fuel source to generate hydrogen and therefore electricity, which is then stored in a Li-ion battery which also acts as a backup power storage. The Suzuki MIO has a 4 litre tank that gives it a range of approximately 25 miles. Theres also an LCD display showing fuel level and power sources. Therefore, unlike wheelchairs that rely solely on mains charging of the battery, it addresses users fears of being stranded at some distance from their home. Previous Post: Toyota to produce the Toyota Endo?